If you are a regular reader of Good. Food. Stories., chances are you’ve traveled to a city or region specifically to eat or drink something local to that area, so you will probably relate to the practice that my fiancé Anson and I have of getting to know a place through its food. It’s so much a focus for me that my first thought when planning a trip is, “Ooohh, I wonder what good restaurants they have?” And so it was this summer when we visited Barcelona. The first thing to know about Barcelona is that it’s in Catalonia, which is basically a different state within Spain. They speak Catalan (which combines elements of Spanish and French) as well as Spanish, and are considered an autonomous region of the country. 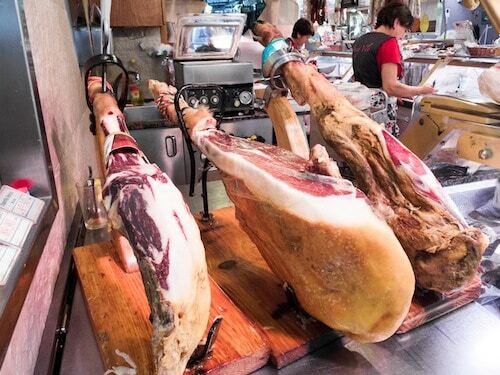 So a lot of things that you take for granted about Spanish food and culture—bullfighting, flamenco, sangria—do not necessarily apply to Barcelona. The varied history of Spain, particularly along its Mediterranean coast, led to the layered cultural influences that make up the country’s cuisine, both classic and modern. While paella, tapas, and sangria did not originate in Catalonia, you will find them in no short supply here, especially in the tourist corridors. We did our best to learn about true Catalan food and try as much as we could, but in the end our education was more about sitting in a Roman-era plaça, enjoying local food and cava, and looking around at history. 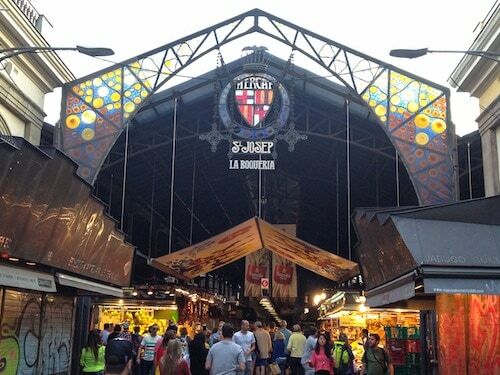 We chose our rental apartment based on its proximity to the famous Mercat de la Boqueria (Rambla, 91; +34 93 318 25 84), which we visited almost every day. It was a riot of fruit, vegetables, candy, meat, cheese, and people (like us!) taking pictures and stocking up on gourmet treats. Not to be missed if you are a food lover, but be prepared for the crowds. Fortunately, the vendors were all friendly and patient, despite the circus atmosphere, and between the mercat and the Carrefour supermarket nearby, we had everything we needed for breakfast and snacks at our apartment. On a friend’s suggestion, we went to La Biblioteca Gourmande (Carrer Junta de Comerç, 28; +34 93 412 62 21) on our first night. 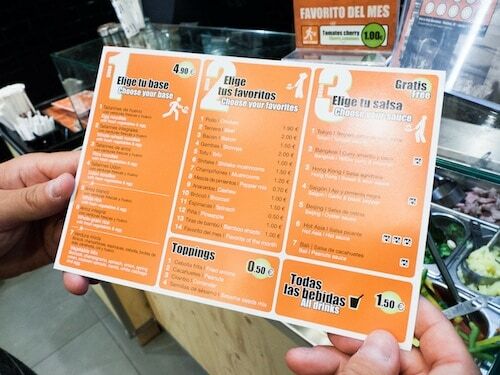 It was a perfect “farm-to-table” style restaurant on the artsier side of La Rambla. The server tried to talk us into tiny eel for our first course, but we went with impossibly thin eggplant chips drizzled with honey instead. 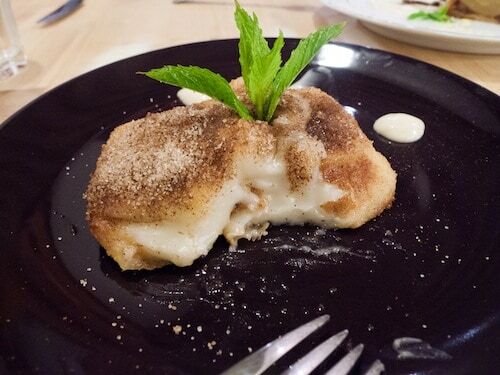 Without question, we had to try leche frita amb canyella (fried cream with cinnamon)—a traditional Catalan dessert. I read from multiple sources that Alkimia (Carrer de la Indústria, 79; +34 932 07 6115) was the place for food lovers to eat and we weren’t disappointed. A multi-course lunch began with Champagne and an amuse bouche of a liquid pa amb tomaquet, the ubiquitous Catalan side of bread rubbed with fresh tomato and garlic, then drizzled with olive oil. Alkimia’s version was tomato water in a shot glass, with a float of olive oil and sprinkling of breadcrumbs. I was trying to be very low-key in the high-end atmosphere and didn’t take pictures of the first dish. I’ve been kicking myself ever since. 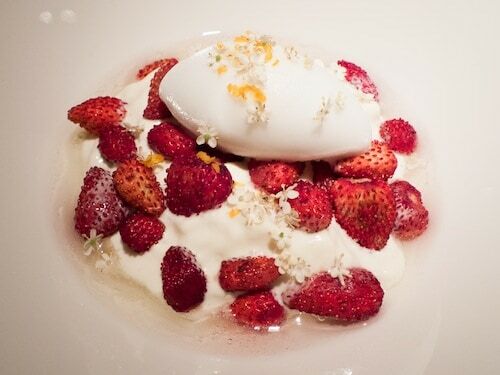 A parade of well-produced and presented dishes followed the amuse, ending with a dessert of crème and mini strawberries dotted with minuscule edible flowers. Alkimia was as indulgent and delicious as we were led to believe; it was truly a first-class meal. We met up with old family friends of Anson’s who live in Barcelona at Restaurant Kaiku (Plaza del Mar, 1; +34 932 21 90 82) in the fishing neighborhood of Barceloneta. According to them, this is one of the few places they recommend for ordering paella—so we got two. 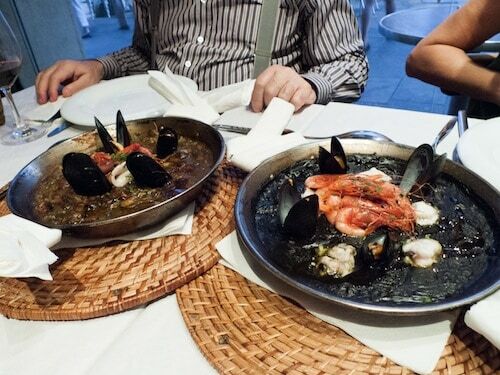 In the photo above, squid ink paella is on the right, and traditional paella is on the left. On our way back from dinner, we walked up Carrer del Malcuinat, which, our friends explained, translates to “Street of Bad Cooking,” originating from the days when the fishermen ate along here for the cheap food. 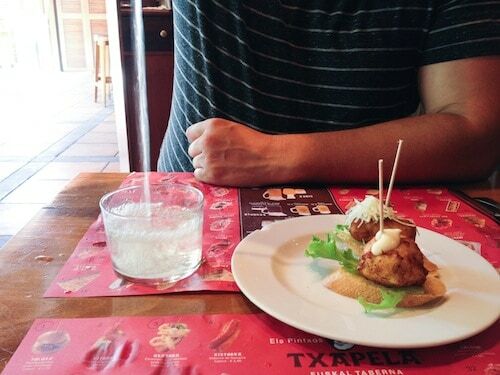 Our Basque pintxos (tapas) experience came from a chain restaurant called Txapela (Passeig de Gràcia, 8; +34 934 12 02 89), whose name references the Basque beret. I was delighted by the waiter’s traditional performance of pouring our txakoli wine from on high, and had to get a shot of Anson doing the same. Again, we declined the baby eel, but made an afternoon of grilled veggies with cheese, potato croquetas, mini hamburguesa, manicotti with mushrooms, and more. One of our favorite casual meals (that we actually ate twice) came from a very busy quick-service place called Wok to Walk (La Rambla, 95; +34 678 60 45 23). Admittedly, it was not Spanish in any way, but there are only so many meals that you can eat of ham, cheese and bread. Pick your noodles or rice, pick your ingredients, pick your sauce, and they wok it while you watch. Wok to Walk was a welcome change from the somewhat homogenous offerings of most restaurants, and gave us a little taste of home on our long trip. Another great thing about this place—water and beer are the same price. We had a pitcher of sangria one of our first nights, and decided we didn’t need to try it again—that is, until we saw cava sangria offered on another restaurant’s menu. 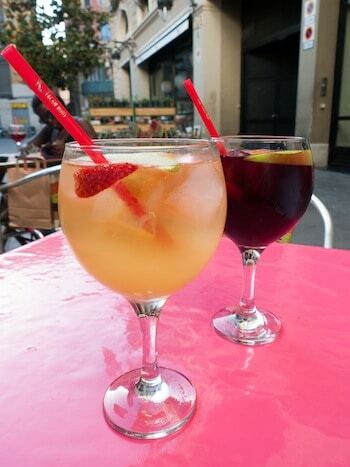 This version of sangria, made with the sparkling wine of the region instead of red wine, made for a whole different sangria experience.